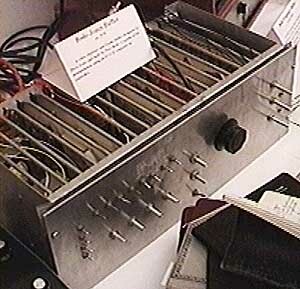 The Jones Buffer is a black and white image buffer, which operates as a self-contained unit or in conjunction with the computer. The controls on the front panel are operative in the stand-alone mode. This allows for real-time digitization of the incoming signal, the ability to grab or store a single page, and a method of selective storage which uses a keyer-like function to select a clip edge between the real-time image and a stored portion of that signal. With computer control, software written on the Z-80 system allows the storage and playback of 16 pages of images. 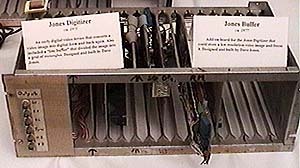 Variations in storing and playing back pages are made by using the analog and digital inputs on the D+7A interface. This method of frame animation can be used in conjunction with the selective storage capability. The memory section has 128,000 bytes which can be divided in different ways. If the resolution is 256 pixels per horizontal line by 256 horizontal lines, there are 16 pages of memory. Each page can store one image. The images stored as pages are derived from the digitized video input. By a process called selective storage, the buffer can grab a single whole image or selective sections of an image. Using a second video input image as a reference, a keyer-like device determines what part of the image, in terms of gray levels, will be up-dated with new information to be stored and what part will remain from the last storage process. Using the computer, you can also write on top of the stored information or create and paint new images. Only one page of memory is viewed or accessed at a time. When the page is accessed, you are either reading the image or writing on what is already there. By grabbing and storing separate images, one in each page of memory, you can then read each page back in a sequence, creating animation. The output of the buffer is a digital signal which is converted to an analog signal. This signal then can be further processed using other imaging techniques before it is recorded or displayed. In either mode, the video signals are routed to and from the buffer on the matrix. There are 2 inputs, a video signal input and a clip input. There is one output. When using the Jones buffer in the stand-alone mode, programs like STROBE64 and TESPNEW can be used. The Jones Buffer can be used with the CAT buffer, and both routed through the matrix. When the Jones is in computer control mode, you must used programs written only for this buffer, for example NEWGRAB. This occupies the Z80 computer and D+7A box so the CAT cannot be used.